Posted by Admin in Novell Open Suse Linux, Playstation 3. OpenSUSE 11.1 includes some of the latest innovations from the open-source community and other projects in the openSUSE Project. GNOME users now are able to accomplish more in a more powerful Nautilus file manager, which now features tabs to keep the desktop tidier. Managing and editing photos with F-Spot is now easier, with editing tools featured prominently with your photos. Keep in touch with your friends and colleagues with Pidgin, the IM client, and Ekiga, a new VoIP client which features great support for video chat. The Totem movie player is now able to watch YouTube videos, with support for searching built right in, or you can watch digital television with Totem & GNOME’s enhanced support for DVB. KDE users can now experience the power and innovation of KDE 4.1 built right in to openSUSE 11.1. openSUSE features the latest features from the KDE desktop. On top of that openSUSE has added the most requested and missed features like cube desktop effects, auto-hiding panel and ability to run Folder View plasmoid as desktop. Users who prefer the legacy KDE 3.5 experience have the option to install that instead of 4.1 if they so choose. But when you need to put away those fun apps and get some work done, openSUSE 11.1 has you covered with OpenOffice 3.0 Novell Edition, the newest version of the popular office suite. Included are a word processor, presentation creator, spreadsheet creator, and more. Some of the new things in OpenOffice 3.0 includes spreadsheet collaboration, the ability to edit multiple pages in the word processor, and improved notes in the word processor. With openSUSE, OpenOffice is able to read and write all Microsoft Office files, including those made by Office 2007. Another new app is Tasque. With Tasque, you can easily add and manage your to-do list, and look good while doing it. In addition, Tasque can synchronize with Remember the Milk, a popular online to-do manager, or Evolution’s task list, so no matter where you are or what you use, moving to and using Tasque is an easy procedure. 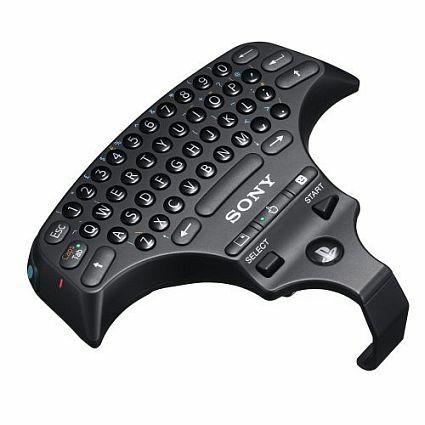 Posted by Admin in Playstation 3, Playstation Home, SCPH-98048 Wireless Keyboard, Sony Computer Entertainment of America. Posted by Admin in Playstation 3, Playstation Home, Playstation Underground, Sony Computer Entertainment of America. With only weeks away from a Official Open Beta for Sony Playstation Home Concept, They been testing the Facebook, Myspace interoperability features over in Japan since Q2 of 2008. and I’m very happy to see the North American version of such services finally taking shape. Posted by Admin in AutoDesk Maya, Insomniac Studios, Playstation 3, Resistance Fall of Man 2, Sony Computer Entertainment of America. Sam Sharit is a senior character artist at independent videogames developer Insomniac Games, located in sunny Southern California. 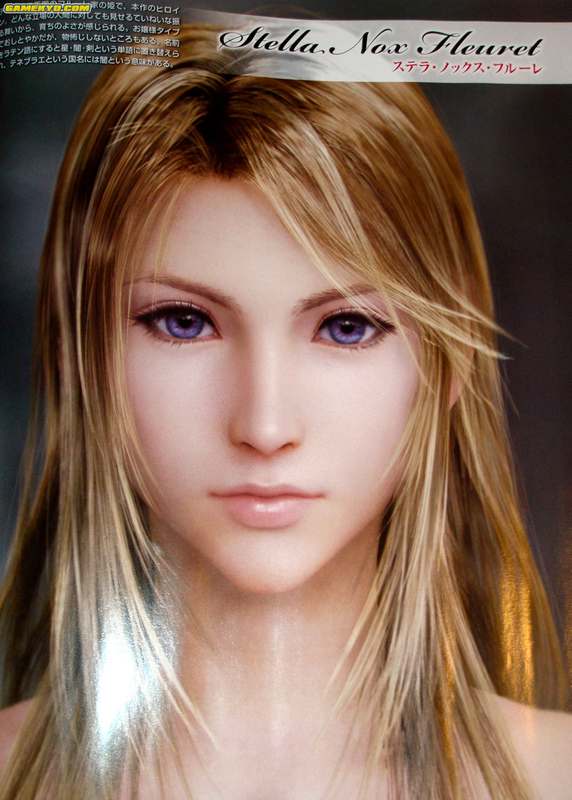 His role there involves mentoring junior character artists, along with the creation and development of character-related art and systems. This includes modeling, texturing, pipeline creation, and scripting. A classically trained artist, Sam started producing digital art in 1997. He has contributed to several AAA games, including Dark Age of Camelot, Duke Nukem Forever, Fallout 3, and Insomniac’s acclaimed Ratchet & Clank Future: Tools of Destruction. He also has worked on a wide range of projects outside of games, including military contracts, music videos and more. Sam lives in Los Angeles. Sam: I have worked on several next-gen games and I can say that there really is no standard and it depends on your tech. I have never been able to make 60,000 poly models on the other games I have worked on. I was taken back a bit by how far I could push the polies here at insomniac and it really comes down to having an engine that can plow through that much geometry. I am certain that this number will continue to raise in the future for us, and as developers come to grips with the hardware you will see higher geometry counts all around. Posted by Admin in GridNetworks, HD Streaming, Playstation 3. Seattle Based Company GridNetorks to offer HD Quality Streaming to Playstation 3 users via its GridCast (P2P) Application. 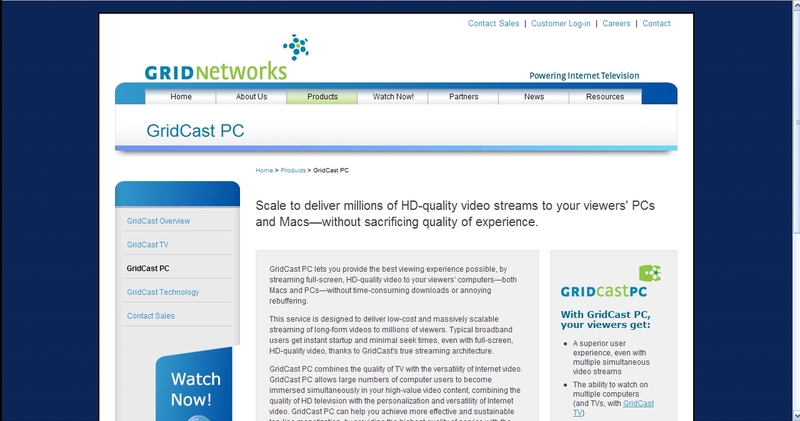 GridNetworks, an Internet video delivery startup whose backers include Comcast and Cisco Systems, is launching a service that lets content providers funnel Web video to TVs by way of Microsoft’s Xbox 360 videogame console and other devices. The company’s GridCast TV service is supposed to work with any device that supports Universal Plug and Play(UPnP) home-networking protocols. Initially it will work with Xbox 360s, and GridNetworks plans to extend it to Sony’s PlayStation 3 and other UPnP-enabled products. The idea: to provide a path for Internet video to the TV without requiring consumers to buy and install an extra set-top device. The company said three video-content providers—Revision3, IndieFlix and HavocTV—are testing out GridCast TV. According to GridNetworks, the service already has the potential to reach millions of homes, with roughly 20 million Xbox 360s and 15 million PlayStation 3s sold worldwide. However, not all of those consoles have been connected to the Internet. To use the service, a consumer first must have an Xbox 360 or other supported device connected to a home network. Then he or she downloads and installs a 3-Megabyte application, the GridCast Connector, on either a PC or Mac. That application is automatically discovered by a UPnP device, such as Xbox 360. When the consumer selects GridCast-enabled video on a content provider’s site to watch on TV, the software downloads the file and transfers it to the UPnP device. The video is then accessible from the device’s on-screen menu. “One of the key values of this service is, we isolate the content providers from having to worry about what device consumers are going to use to watch on TV,” Naughtin said. GridNetworks director of product management Tim Fujita-Yuhas said the Web-to-TV service preserves a content owner’s existing business models, including download-to-own, subscription pricing and in-line video ads. GridCast TV delivers video in Microsoft’s Windows Media format. The company will provide encoding services and media management, reporting and analytics, storage and video delivery. Naughtin said pricing has not been finalized, but the company is looking at charging per view, per byte, per minute per user or some combination of those. Currently, the GridCast TV service does not support any digital rights management technologies. However, Naughtin said the company would be able to accommodate customers’ DRM requirements if necessary. The Seattle-based company, founded in 2005, has raised $9.5 million from Comcast, Cisco and Panorama Capital. Eventually, Naughtin imagines the GridNetworks technology will be embedded into cable or telco TV set-top boxes. Posted by Admin in Grand Turismo Prologue, Playstation 3, Polyphony Digital. Polyphony Digital also presented two technological trials for the next generation at this event. Both of the presentations, were founded on the philosophy of “achieving the highest possible quality” held over the years by Gran Turismo. One of these, was a time trial competition using Sony’s newest digital cinema projector, the “SRX-S110”. Gran Turismo 5 prologue is already in Full HD resolution at 1920 x 1080 pixels, providing the highest resolution possible in today’s TV content. However in this time trial, the Full HD image was increased to twice the resolution both vertically and horizontally (4x the surface area), enabling game play at an ultra high resolution of 3840 x 2160 pixels. This was performed by connecting and synchronizing four Playstation 3’s outputting a quarter of the image each at 1920×1080 pixels, but you must remember this demands an extremely high quality image from the source that can withstand the ultra high resolution. It can be said that this demonstration was only made possible, because the source image was Gran Turismo. What supported this time trial on the display side, was the newest digital cinema projector from Sony, the SRX-110. This “4K”SXRD”(*1) projector is the next generation in projector technology, enabling a resolution of 4096 x 2160 pixels, equivalent to the high resolution image of 35mm film. The high 4000:1 device contrast ratio and a response time of 5 milliseconds, also adds to the level of breathtaking image expression introduced here. The crowd was simply amazed by the clarity of the image displayed on the massive 220 inch screen, and the players who participated in the time trial expressed their excitement of how perfectly in focus the screen is even close up, and at the quality of Gran Turismo. Posted by Admin in Playstation 3, Playstation Network, Playstation Underground, Sony Computer Entertainment of America. Early next week, we’ll be integrating additional community features into PlayStation.com. We are excited to roll-out the first phase, which includes the ability to sign-in to PlayStation.com and, soon after, PlayStation.Blog with your PlayStation Network ID. Of course, your PlayStation Network ID gets you access to all the good things on the PLAYSTATION 3 and PSP, including games, movies and TV shows on the PlayStation Store, online gaming, and, soon to come for PS3, PlayStation Home. In addition, we are making enhancements to the gamer profile features. Your profile will include your PSN online ID, your avatar, and a short “about me” section. You’ll also be able to display your friends list and, on the game detail pages, you’ll be able to include ratings and reviews for all of your favorite games. These features were created so that you can make new friends, learn new tricks and tips, talk trash, offer advice, console the defeated, praise the winners, and more. If you have an Underground account on PlayStation.com and haven’t already merged it with your PlayStation Network ID, click here to do so. If you don’t have an Underground account but would like to create a PlayStation Network account to participate in the new features on PlayStation.com, click here. We decided to dissolve the PlayStation Underground program in order to provide more PlayStation fans with a glimpse into the PlayStation Network world via the web. 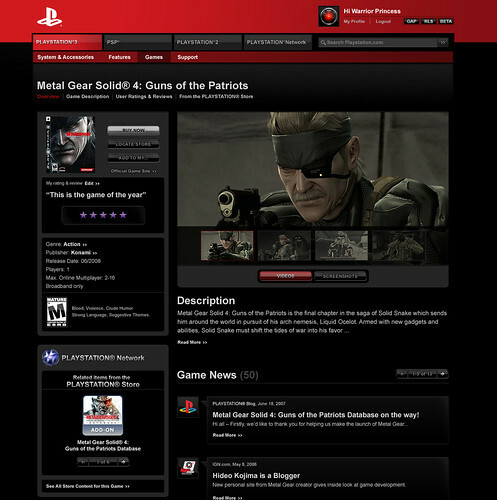 We hope you enjoy this next step in the evolution of PlayStation.com. Stay tuned; before this year is over we’ll have more enhancements for your gamer profile. Posted by Admin in Playstation 3, Sony Computer Entertainment of America. Thank You for all the wonderful memories, along with a very bright future for our beloved Playstation 3 system. Like many early adopters I paid the full retail price for my CECHA01 and after two great years Playstation 3 is truly coming into its own. With Resistance 2, Ratchet and Clank FTOD, Uncharted Drake Fortune, Heavenly Sword, Motorstorm Franchise, Little Big Planet. With the Playstation Home just around the corner. And games like Guerrilla Studios Killzone in which I’ve been beta testing for Sony. The future is bright! Posted by Admin in Firmware Updates, Playstation 3. 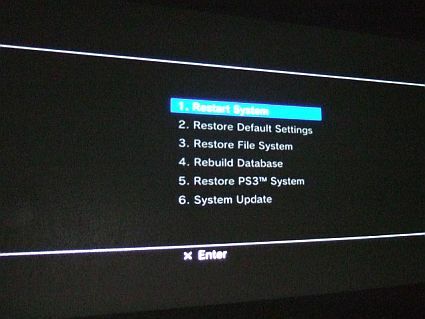 It appears that firmware 2.50 also added one other feature, meant to help PS3 owners that are trying to troubleshoot their system. A recovery menu (pictured above) gives users access to a variety of restore features. It will even allow users to install a new firmware update, should anything go wrong during the installation process. 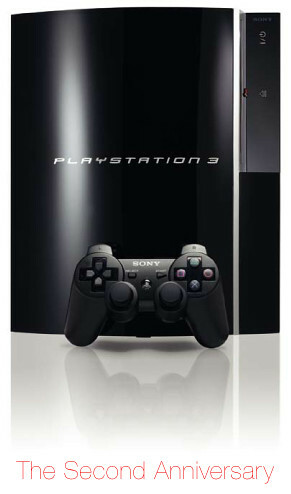 To access the menu, you must hold down the power button to turn on the PS3 until you hear three beeps. Then the menu will show up. There are a few reports of systems bricking after firmware updates, so this may be Sony’s attempt at creating a fix for future problems. Hopefully, we’ll never have to actually use this feature — but if we do, it may be a quick way of avoiding a trip to the post office to send the PS3 to Sony’s support center.